SD cards have largely supplanted most other card-based storage devices, in all but a few niches. Available in standard, micro, and the rather obscure mini sizes, they’re used in everything from digital cameras to car stereos and console ROM carts. For most users, storing them consists of tossing them in a bag, occasionally in a plastic case that’s barely any bigger than the card itself for a little extra protection. This can get frustrating when carrying multiple cards, but [Dranoweb] has a solution. [Dranoweb]’s design is similar to a Swiss Army knife, repurposed with many fingers, each with slots for holding everyone’s favourite storage devices. All the parts barring the screw are 3D printed. There are various designs of the storage fingers, allowing the build to be customized to suit varying quantities of SD and microSD cards. There’s even a deep-pocketed piece for USB drives and small adapters, and an oversized design for Nintendo DS carts. It’s a tidy design that makes it that much less likely you’ll lose your microSD in the bottom of your backpack. Now, if you need to interface with an SD card, we can help you there too. A Jeep is fun offroad, a motorcycle perhaps even more so. Diehard renegades go even further and get about in Unimogs and on snowmobiles. [amazingdiyprojects] might just have topped them all however, with his latest project – the astonishing Inflatable Car. Despite the name, it’s a vehicle that defies clear definition. Consisting of a lightweight aluminium frame and exposed seat, the construction is almost 100% hacked. PVC fabric is used with advanced adhesive tapes to create inflatable wheels that are 2 meters in diameter. Vacuum cleaners are used to inflate the massive tyres, with custom 3D printed valves to ensure even inflation. Drive is courtesy of four handheld concrete mixers, repurposed for their torquey motors and robust geartrains. Even the user interface is a triumph of found parts – consisting of former cordless drills, used for their PWM hardware and covered in extra switches. Looking like a moon lander from a strange 1950s version of the future, the machine is impressively nimble for its size. Episode 1 starts with a single wheel hooked up to the inflation gear and a single drive motor. Just a few short months later, episode 7 has the prototype machine crawling out from the confines of the back garden and out into the street. The machine is already impressively fast and capable, and we can’t wait to see what happens next. It’s a build that is truly impressive in its scale, though we’ve come to expect no less from [amazingdiyprojects]. Video after the break. If you’re the kind of person who’s serious about using open source software and hardware, relying on a medical device like a pacemaker or an insulin pump can be a particular insult. You wouldn’t trust the technology with your email, and yet you’re forced to put your life into the hands of a device you can’t examine yourself. Unfortunately we don’t (yet) have any news to report on open source pacemakers, but at least now there’s an open software and hardware hearing aid for those who need it. The Tympan project aims to develop a fully open source hearing aid that you can not only build yourself, but expand and modify to fit your exact specifications. Ever wanted to write code for your hearing aid with the Arduino IDE? No problem. You want Bluetooth, I2C, and SPI? You got it. In truth we’re not sure what this kind of technology makes possible just yet, but the point is that now those who want to hack their hearing aids have a choice in the matter. We have no doubt the community will come up with incredible applications that we can’t even begin to imagine. But these open hearing aids aren’t just hackable, they’re affordable. Traditional hearing aids can cost thousands of dollars, but you can buy the Tympan right now for $250. You don’t even need to check with your health insurance first. Such a huge reduction in price means there’s a market for these outside the hardware hacking crowd, and yet another example of how open source can put cutting edge technology into the hands of those who would otherwise have to go without. 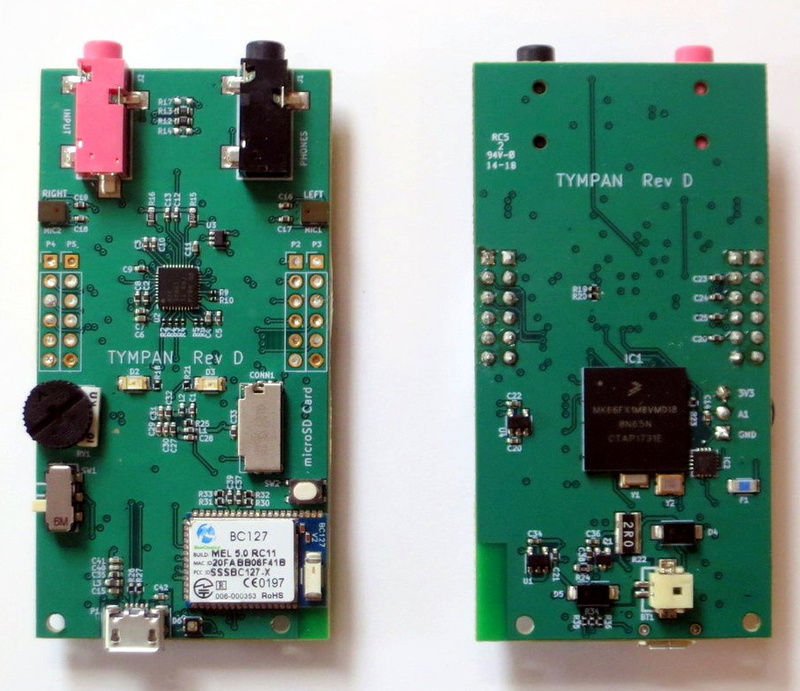 The latest version of the Tympan hardware, revision D, is powered by the Teensy 3.6 and features a Sierra Wireless BC127 Bluetooth radio, dual MEMS microphones, and even a microSD slot for recording audio or logging data. It might be a bit bigger than the traditional hearing aids you’re used to seeing, but with an external microphone and headphone setup, the wearer could simply keep it in their pocket. We’ve seen DIY hearing aids before, but unless you’re willing to carry a breadboard around with you, they’ve generally been limited to proof of concept sort of builds. We’re glad to see a mature project like Tympan join the growing movement for open source medical hardware; it’s a another big step forward towards democratizing these critical pieces of technology. You’ve probably seen the videos of a grape — cut almost totally in half — in a microwave creates a plasma. A recent physics paper studies the phenomenon with a lot of high-tech gear and now the actual mechanism is known. [Veritasium] interviews the scientists and explains the grape plasma phenomenon in plain language. You can see the video below or read the paper directly. Turns out the grape is about 1/10 of the microwave frequency and the refractive index of the grape at microwave frequencies might be as much as ten. A whole grape can get all the microwaves trapped inside, but two grapes — or two halves — that touch create fields strong enough to ionize the air. We know you love the original art on Hackaday. Those fantastic illustrations are the work of Joe Kim, and he joins us as a guest on this week’s episode to talk about his background, what inspires him, and how he pulls it all off. This episode is still packed with hacks. Editors Mike Szczys and Elliot Williams somehow stumble into two projects that end up generating hydrogen (despite that not being their purpose). But that art angle this week goes beyond Joe’s guest appearance as we look at a hack to add green curve tracing goodness on a black and white CRT, and an incredible take on a string art building machine. We get a look at interesting hardware that landed on the clearance rack, ultralight robots that move with flex PCB actuators, a throwback to mechanical computing, and giving up control of your home heating and cooling to a Raspberry Pi.